"I'm not sure if you can help. 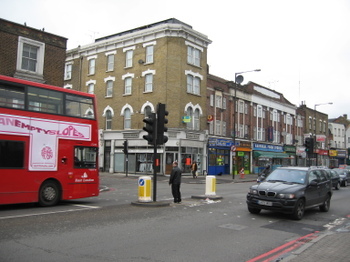 I seem to remember reading that the junction of Downs Road and Lower Clapton Road was going to be redeveloped to allow pedestrians to be able to cross this busy junction safely, but there is no sign of change. Do you know if there still a campaign or are there any plans to change this to improve safety?" Sheila: "Are they going to sort out the crossing, then?" Workman: "Yes, in a few months' time." Sheila: "Won't you have to dig all this up again?" Workman: "Yes. We might as well be in the pub." Sheila: "That's a bit mad, isn't it?" Workman: "I couldn't possibly comment." Well, at least it sounds from this as though change is at last on its way to the Killer Crossing. Possible confirmation comes from Zaf at the dry-cleaner who told Sheila he's recently seen men bearing clipboards and optical surveying equipment (or something) taking their lives in their hands on and around the roads concerned. I've emailed Cllr Rathbone to ask for more information and also made inquiries at Transport For London, which is the body responsible for roads and crossings. Watch this space. Have been lurking around (and enjoying) this blog for a while now. But this post about the killer junction has spurred me into commenting (and signing up to typekey... more passwords and log ins to remember...help). I am a fellow Claptonian living on Clarence Road which I love, but am not very enamoured of the deathdefying journey I am obliged to take if I want to get to the shops on Lower Clapton Road. The junction (Downs Road and Lower Clapton Road) is truly scary and not to be taken in a rush or feeling anything less than fully alert. Am always thinking that I should call the council about it (but as of yet haven't done so)... do you fancy setting up a petition?